Singapore, 20 Jun 2013: DHL Global Forwarding, leading provider of air, sea and road freight services in Europe and Asia, has developed a multi- modal means to reduce transit time between Western China and Russia by up to 40 days compared to ocean freight at one-sixth the cost of air freight. The solution builds upon DHL's latest multi-modal service launched earlier this year in partnership with YHF Logistics, operator of the rail service that runs along China's West Corridor � the Chengdu Express Train. 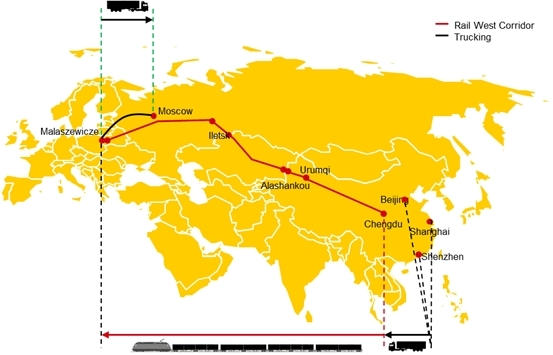 Dubbed the fastest rail connection between China and Europe, the service starts in Chengdu, China and runs along China's West Corridor to DHL's intermodal hub in Małaszewicze, Poland. Leveraging and expanding on this service, goods originating from various locations in China bound for Russia can now be trucked to Chengdu, transported from Chengdu to Małaszewicze by train and then trucked to Moscow � all within 20 days. The door-to-door service departs once-a-week every Saturday from Chengdu and can be utilized by businesses in any sector.